Milton's Story . . .
Update 03/11/2013: "He has great stamina and loves a treadmill." Milton is making wonderful progress! With continuing and consistent training, he has been accepting that he is not the boss! Mealtime has seen much improvement. Milton sits and waits while food is prepared and waits his turn until called to the dish. This is great! He does eat well with other dogs but will always need supervision. If dining with others, it’s important that they are directed away from the dishes as they finish, rather than being left to hang around each other’s bowls. His family has also found that treats, such as a bone or Kong, are best given when Milton is alone, rather than when another dog is around. His family can now take a food treat away from Milton, provided he is outside of his crate; they’re working on treat removal when he’s inside his crate. He no longer takes possession of objects that he shouldn’t when his people leave the room and he listens when told to go to “place.” He no longer cries in his crate. All important progress for this boy!! Warmer weather ahead may bring something else new for Milton. His foster mom wants to try some tracking training with him. He loves to be outdoors; he is still outside playing and needs to be called when his canine buddies are at the door and asking to go in. He has great stamina and loves a treadmill. He does 3 mph for an hour and a half and would still keep going if he didn’t have to give a turn to another dog. He has a powerful nose and would probably make a great hunting partner. Milton’s future lies with a family that does a lot of outdoor activities. He is a lapdog for sure and will cuddle with you all night, but he’ll reach his greatest potential in the out-of-doors. He is a high energy dog and loves nature and playing in it. His foster family feels he will love working in it too. An adopting family will need to provide Milton with strong leadership as well as time spent outdoors. The exercises he is doing in foster care should continue……the feeding routine, going to “place” for a period of time many times per day, etc. All set Milton up for calmness, dissuade food aggression, and give him confidence in the pack he is in. Milton is nothing short of adorable. He gets mooshed on much. It won’t be long until he’s good to go with his new skills. Keep an eye out; once ready, he’ll move on quickly and have an exceedingly bright future!! Update 02/04/2013: " Increased training and exposure to other dogs will help his doggie social skills." 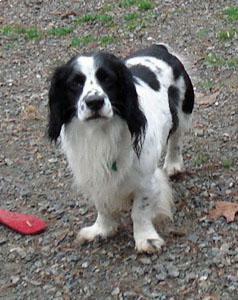 Due to some dominance issues with other dogs, Milton was returned to a new foster home. His foster mom finds him to be a happy-go-lucky little guy who is absolutely adorable! A skirmish with another dog over food resulted in Milton getting knocked around a little bit. He received two stitches and now sports the dreaded Elizabethan collar until healed. Once he is free of the cone, Milton’s training will resume in earnest. His foster mom has been working on improving Milton’s manners and following commands, such as sitting and staying in place while waiting for food preparation. She already sees progress although, like a young child, Milton likes to test his limits by sometimes responding just enough to qualify as “technically” obeying a command. For example, when told to sit on a mat and wait, Milton will sit HALFWAY on the mat, giving his foster mom a look that implies that he’d prefer to be in charge of decision-making. Because he’s so darn cute, his foster mom cautions his adoptive family to be firm and not give in to Milton’s adorableness. Milton loves his humans and is much more interested in what they are doing than in following the canine pack. 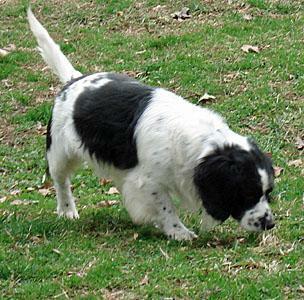 Increased training and exposure to other dogs will help his doggie social skills. Because food has been at the center of some of Milton’s disagreements, his foster family feeds him with one other dog, watching carefully for any squabbles, to help him learn to be nice during feeding time. Watch for more news on Milton’s progress as his training continues. With love and proper guidance from his people, Milton will be one special member of his forever family. Original: "While Milton was in a temporary foster home......he befriended a granddaughter and rode around with her in her wheelchair; he thought that was great fun and so did she." Milton arrived at a Virginia shelter as a stray and quickly came to MAESSR. The shelter staff wanted MAESSR's help with him since he showed some minor food aggression while with them. In his foster home Milton would growl and snap at another dog that came close to his food when he was eating. By contrast though, his foster mom has petted him while he was eating with no response. His savvy foster mom suspects Milton was extremely hungry at some point in his life. Now that he sees food is readily available, it is not such a treasure that must be guarded. The longer Milton is in his foster home, the better he does at meal time. What a difference it can make when such a basic need is met! This youngster is in good health and has a very loving personality. Milton is also very nosy and wants to be in the middle of everything going on, especially if that means hopping in the car for a little travel. He does pull a little on his leash but settles down a few minutes after starting out on a walk. Aside from his diminishing worries at mealtime, Milton has done well with the multiple dogs in his foster home but it's people that he really enjoys. He was very excited when an 8 year-old friend stopped by to visit his family. He wanted to play and play with this little girl. While Milton was in a temporary foster home before his current one, he befriended a granddaughter and rode around with her in her wheelchair; he thought that was great fun and so did she. 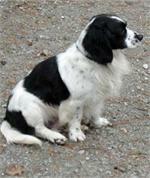 Milton is possibly a springer mix. 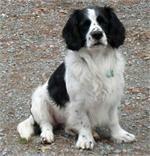 He is a small boy but is marked like a springer and acts like a springer. In the spirit of the season, MAESSR decided to bring him into its program and find him a wonderful loving home. His foster mom has always heard that good things come in small packages and knows, as sure as Christmas is coming, that some lucky family is going to scoop this boy up!